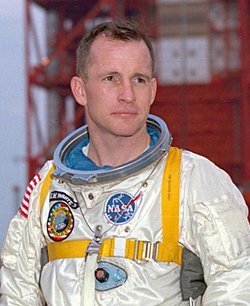 Edward H. White II became America’s first spacewalker on the Gemini 4 mission. He died in the tragic 1967 Apollo 1 launch pad fire. He was born November 14, 1930, in San Antonio, Tex.. He received a Bachelor of Science degree from the United States Military Academy in 1952, a Master of Science degree from the University of Michigan in 1959, and an honorary Doctorate in Astronautics from the University of Michigan in 1965. Following West Point, he received flight training in Florida and Texas, then spent 3.5 years in Germany with an Air Force fighter squadron, flying F-86s and F-100s. In 1959 he attended the Air Force Test Pilot School at Edwards Air Force Base, Calif., and later was assigned to Wright-Patterson Air Force Base, Ohio, as as experimental test pilot with the Aeronautical System Division. White, an Air Force lieutenant colonel, was selected as an astronaut by NASA in 1962. He was pilot on the four-day Gemini 4 mission that began June3, 1965. The commander was James A. McDivitt. During the first day, White stepped outside the spacecraft for a 21-minute spacewalk during which he maneuvered on the end of a 25-foot lifeline by using a hand-held jet gun. During the remainder of the flight, McDivitt and White completed 12 scientific and medical experiments. He was recipient of the Air Force Commendation Medal, the NASA Exceptional Service Medal, the Arnold Air Society JFK Trophy for 1966, the Air Force Systems Command Aerospace Primus Club Award, the General Thomas D. White United States Air Force Space Trophy for 1965, and was selected one of the Ten Outstanding Young Men of America in 1965. Edward White was inducted into the U.S. Astronaut Hall of Fame on March 19, 1993.